Amanda Nunes, the current UFC women's Bantamweight Champion, is scheduled to fight Ronda Rousey at UFC 207 on Friday. Editor's note: This feature was originally published ahead of UFC 207. Her nickname is The Lioness. Fitting, given Amanda Nunes' tenacity in the octagon, but its origin predates women's inclusion in the UFC. It was given to her when she was the only woman at her first gym, whose logo was that of two lions. The name stuck, and she made it permanent with a tattoo of a lion on her right shoulder. Not to mention, she's powerful. When she walks, each strike of her foot against the concrete is an imposition of her will. She has broad shoulders, her hair is shaved on the sides of her head and long in the middle, and she has a reach of 69 inches, four inches longer than her height. Wearing pink shorts and a mouth guard stamped with fangs, Nunes, 28, radiates toughness. Who is the next Ronda Rousey? She's the defending UFC women's bantamweight champion -- something that has gone forgotten amid the buildup for her next fight, UFC 207. It's better known as Ronda Rousey's return. If Nunes wins, she'll become the only woman other than Rousey to successfully defend the women's bantamweight championship and will effectively halt Rousey in her quest to cement herself as the undisputed champion. If she loses, Nunes will be but a footnote in the narrative of "Rousey's Redemption." At least for the time being. In preparation for the moment, Nunes has kept much of her routine the same. She trains at American Top Team, a gym in Coconut Creek, Florida, 20 miles north of Fort Lauderdale and less than two minutes from her apartment complex. 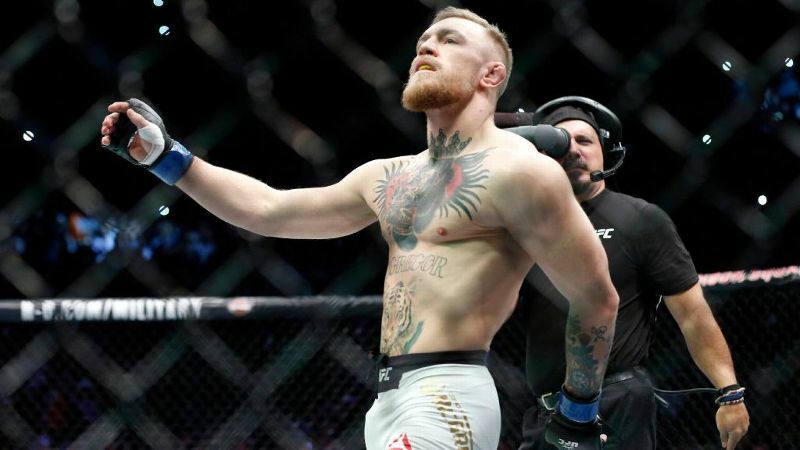 The gym sits just off the highway and is home to several competitive MMA fighters, including UFC's current women's strawweight champion Joanna Jedrzejczyk. The gym's lobby is bright, with a trophy case highlighting American Top Team's best fighters, present and past. The belt Nunes won in her victory over Meisha Tate at UFC 200 is featured in a cube within the glass case. The facility sprawls and is mostly concrete and mat, with vast amounts of open space. It looks like a warehouse. Nunes stands next to a bench and chats with a handful of people who compose a rotating cast of fellow fighters, her partner and UFC strawweight fighter Nina Ansaroff, and Nunes' sister. The gym is buzzing with a class taking place in the center of the space -- even as Nunes, the current champion of one of the most talked-about UFC divisions, prepares to begin her training for the day. This fight, with its high stakes, hasn't pushed her to seclusion. While her competitor has sequestered herself to train in a detached garage in the California mountains, Nunes trains in a public place, with many coaches, each with their own purpose ranging from wrestling, to Brazilian jiu-jitsu, to strength and conditioning, and so on. Amanda Nunes made her nickname, The Lioness, permanent with a tattoo on her back. Today's training partner is former World Extreme Cagefighting (WEC) featherweight champion and American Top Team assistant MMA coach Mike Brown. Nunes walks with Brown into a more secluded area of the gym -- an enclosed square with padded walls and fencing. After steering her around the space with some warm-up exercises, Brown and Nunes get to work. Nunes lays on her back, forearm to his throat. On his mark, she explodes upward, grabbing his wrist. She pins it to his side as she rolls him into a headlock and prepares to take a knee to his face. She is on her back with a forearm to his throat. Rolling onto her left side, she slips under him, wraps her hands around his thigh, lifts and throws him across the mat. She is on her back with a forearm to his throat. She wraps her legs around his neck, adjusts and pushes him off of her. She springs to her feet and is ready for whatever comes next. In the moments between each rep, she rests on the mat, preparing her body to explode -- energy simmering in controlled violence. The calm before the storm. Amanda Nunes bares the fangs on her mouth guard as she trains with former World Extreme Cagefighting (WEC) featherweight champion and American Top Team assistant MMA coach Mike Brown. Wrestling used to be one of Nunes' weaker points. When she was 16, she started training in Brazilian jiu-jitsu, a sport that stuck with her in a way that others (soccer, horseback riding, martial art Capoeira) didn't, and she has a brown belt in judo. She trains to strengthen her best attributes as much as to address her weaknesses, and after two years with Brown and head wrestling coach Kami Barzini, the improvement in her wrestling ability is noticeable. She next picks up her gloves to work on striking with coach Roger Krahl. He leads her through a series of exercises, picking up the intensity as time passes. Her quick breaths slice through the air, hardly noticeable under the thunderous smack of her right fist against the mitt. Left, left. Right. Jab, jab. Smack. She breaks, resting her arms on top of the fence. She catches her breath while chatting with her sister, Portuguese flying off her tongue. Her eyes catch the lens of the camera we brought. She stops talking and holds an intense stare at the lens as beads of sweat fall from her face to the floor. The camera's shutter stops flicking, and she laughs. "I was pretending it was Ronda Rousey." She pops her mouth guard past her lips, bears her fangs and resumes her routine in the ring. 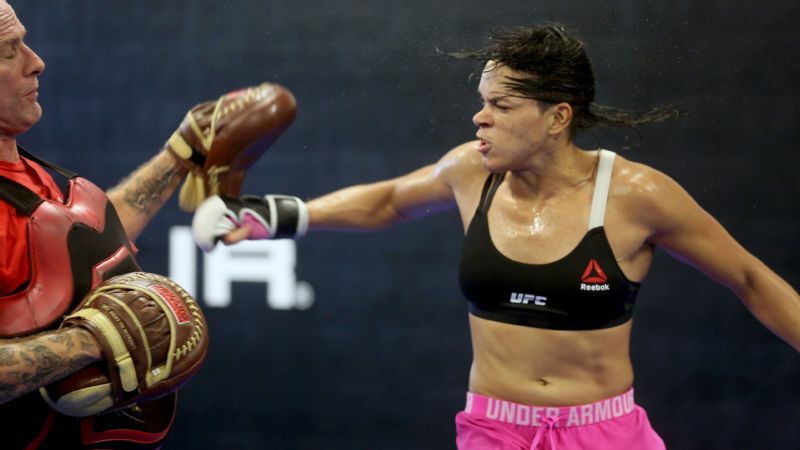 Amanda Nunes trains with coach Roger Krahl. After a few more rounds with Krahl, Ansaroff steps in to help Nunes further hone combinations. The pair have known each other for four years and have been together for as many. As such, there's a deeper feeling of intimacy to their interactions, almost blind to the naked eye. But dotting their training are jokes about Nunes' stinky feet and, at times, a softness with which Nunes strikes. Her accented speech is muffled by her mouth guard, which would make her words unintelligible to many, but Ansaroff never misses a beat. Nunes met Ansaroff at MMA Masters, a gym in Miami. Nunes was living there at the time after moving from New Jersey. After meeting, Ansaroff invited her to live with her, and that was it. Six months later they adopted Romeo, a 100-pound pitbull, and two years ago they moved to Coconut Creek and started training at American Top Team. Ansaroff helped Nunes with her English, even though she didn't really know Portuguese at the time. Their apartment is a modest one bedroom, one bathroom. Ansaroff contends that it's overpriced for the space, "but that's South Florida," she says. But the complex is right next to the gym, making the price worth it for them. They used to drive 70 miles round trip between Weston, Florida, and Miami twice a day for training. "It was awful," Ansaroff says. Posters from previous bouts, including UFC 200, hang on the walls in their living area, and one of Nunes' belts sits on a stool in the corner. There used to be an electronic drum set in the living room as well -- Nunes plays drums and was in a band back in Brazil -- but that has been replaced by a pallet of water. The water and posters demonstrate the small changes in Nunes' life as winning becomes more frequent. For some, it could be overwhelming, but Nunes doesn't let the pressure faze her. If anything, she views it as an opportunity. "There will be people there to see me, but [UFC 207] will be more about Rousey coming back," she says. "I'm OK with that. I want people to be there, to feel that excitement." Nunes moved from Brazil to the U.S. in 2010 to compete in Strikeforce, an MMA organization that was purchased by UFC's parent company that same year. She now lives with her partner and UFC strawweight fighter Nina Ansaroff. Ansaroff makes Nunes lunch after training -- steak and salad. Nunes is in charge of the salad, which is about the only thing Ansaroff trusts her to do. She chops the lettuce, cilantro and avocado while Ansaroff tends to the meat. Ansaroff's cooking and the nearby Brazilian restaurants are among the reasons Nunes doesn't actually miss Brazil. "Whenever I want Brazilian food, I can go to a restaurant," Nunes says. "Tastes exactly the same." She's the youngest of five children and misses her family, but that's the only thing pulling her heartstrings from her native country. "It was horrible in Brazil," she says. "I didn't have any money -- nothing." Nunes moved to New Jersey in 2010 to compete in Strikeforce, an MMA organization that was purchased by the UFC parent company at the time, that same year. She trained with the brother of her former coach in Brazil and secured a contract shorty after getting to the U.S. At that point, she was 5-1, with her first professional bout ending in a loss. When Nunes moved from Brazil, there weren't any women on the UFC roster, and the inaugural UFC women's bantamweight championship wasn't fought until UFC 157 in 2013, when Rousey defended her newly awarded status as champion (she previously held the Strikeforce title). So from 2011 to 2013, Nunes fought twice for the Strikeforce promotion and twice for the all-women's Invicta FC before being added to the UFC bantamweight roster. She went 2-2 in that stint, with losses coming against Alexis Davis and Sarah D'Alelio. She won her first two matches in UFC before being knocked out by Cat Zingano at UFC 178 in 2014. Nunes hasn't lost since, posting wins over Shayna Baszler, Sara McMann, Valentina Shevchenko and Tate. "I left Brazil to follow my dream," she says. "My dream was to become a champion, and I have realized that goal." Amanda Nunes, who trains with UFC fighter Mike Brown, hasn't lost since 2014, posting wins over Shayna Baszler, Sara McMann, Valentina Shevchenko and Meisha Tate. Heading into her first title defense, Nunes faces odds that are not totally in her favor. Rousey opened as a 3-1 favorite, but those odds have narrowed. Rousey is still favored at -140 to Nunes +110, but that isn't anywhere close to what the line looked like before UFC 193 (Rousey: -1650, Holm: +450), when Holm delivered a knockout in the second round. Of Rousey's 12 previous victories, 11 of them came via first-round stoppage. She's a finisher and has a nasty armbar. Nunes, on the other hand, is a striker. 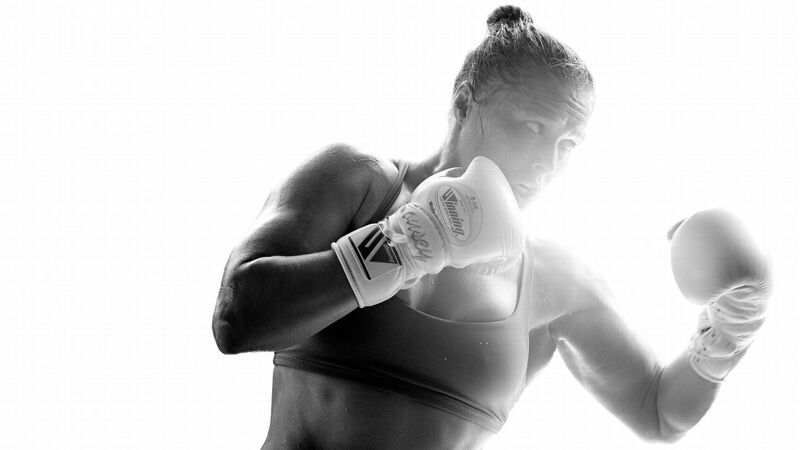 She's not a professional boxer like Holm, but she's trained in boxing since she was a teenager and hits hard. How well she gets her hands on Rousey (or doesn't) could decide the fight, and ultimately the worth of Nunes as a champion at this point in her career. Since Rousey's loss of the bantamweight title in November 2015, no one has successfully defended the belt. Holm lost to Tate, and Tate lost to Nunes. Now, Nunes' first title defense is against the most dominant fighter the division, and perhaps the UFC, has ever seen. "It doesn't matter for me," Nunes says. "She's human, she's a woman like me. I know I can beat her." After lunch, she scoops up Mowgli, the Miami Dolphins T-shirt-wearing Dachshund she and Ansaroff adopted a few months ago, and grabs his leash along with her longboard as Ansaroff wrangles Romeo. The two swap leashes once they get out the door and descend the three flights of stairs to the ground floor. Nunes steps on her long board as Romeo pulls her gently along the sidewalk. It's clearly a well-worn path for this family, as Nunes effortlessly manipulates the board around the bends and shifts in the sidewalk. "We are happy," Amanda Nunes says of the life she shares with her partner Nina Ansaroff. "That's all anyone needs to care about." Nunes lives for these moments. Make no mistake, she's a fighter and a champion, but she also loves life, specifically her life. She watches movies, plays video games on her Wii and long boards with her dogs. Eventually, she wants to open her own MMA gym for women, placing their needs at the center of a training facility -- not just as add-ons, as she has felt at points in her career. Nunes also wants to be a role model for LGBTQ people, living her life in a way that makes sense to her, openly and honestly, hoping that it will make it easier for others to be open about who they are too. "We are happy," she says of the life she shares with Ansaroff. "That's all anyone needs to care about." While Nunes takes her training seriously, she isn't afraid to reward herself for a job well done, which is why she takes the next morning off and hangs around the gym in street clothes while Ansaroff trains. Nunes wears navy shorts and a T-shirt. Her hair is down. She still plans to train today, but not until after sunset. "That's when I'll be fighting," she says of her reasoning for training at night. 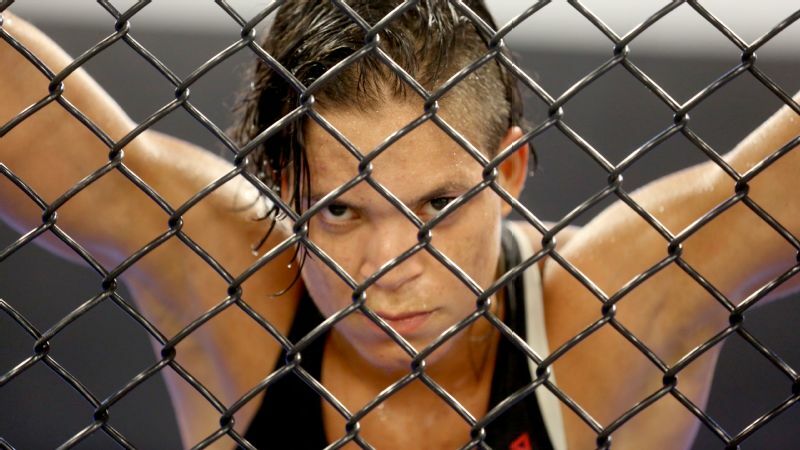 She quietly leans against the fence and looks on as Ansaroff spars with fellow strawweight Tecia "Tiny Tornado" Torres. When Ansaroff pins Torres on her back, Nunes comes alive, rushing over to shout advice to her partner and spur her on. As the action winds down, Ansaroff steps out of box and smiles at Nunes. "She played coach today," she says. 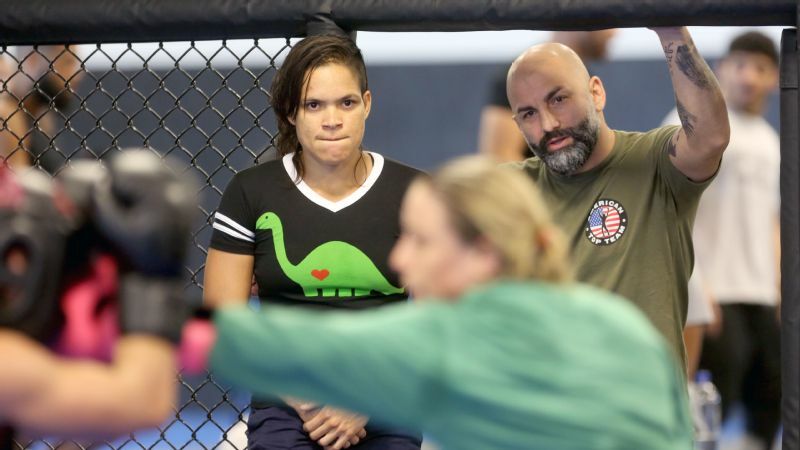 Amanda Nunes and wrestling coach Kami Barzini watch her partner and fellow UFC fighter Nina Ansaroff train for an upcoming bout. Nunes and Ansaroff used to spar, but being in the octagon together challenged Nunes over time. As fighters, Ansaroff and Nunes constantly work to balance not only their dreams and aspirations, but also the physicality of their training with each other. At their previous gym, they'd spar and go full out, which challenged Nunes over time. "I realized that I can't train like that with her," she says. "She's my girlfriend." At American Top Team, it's different. There are more women around to train with, which reduces their need to spar with each other. They can focus on being supportive of each other, and helping each other grow. "We chase the dream together," Nunes says. "I want her to get there because she helped me to get here." Later that night, Nunes prepares to get into the octagon against Barzini. As she approaches the octagon, the other fighters training at the gym stop and start cracking jokes. "The champ is in the house," one of them says. "We'll wipe it down for you," says the other. Nunes smiles and laughs, but the deference is nice, especially given that she isn't shown that level of respect as the current champion all that often. In the promotion for UFC 207, Nunes is hardly present. If she has her way, that will change on Friday. "I wait for the best Ronda Rousey," Amanda Nunes says of her upcoming fight at UFC 207. In the octagon, Nunes and Barzini simulate the length of a full fight complete with round breaks. Krahl, the striking coach, and Conan Silveira, co-founder of American Top Team, offer advice between the rounds as Barzini huddles in his own corner trying to catch his breath. Silveira shouts in Portuguese, his large frame towering over Nunes as she sits in the chair trying to catch her own breath. As Nunes and Barzini resume, Krahl takes his seat just outside the fence of the octagon, shouting his encouragement. He, along with Silveira and Barzini, give Nunes their undivided attention. They push her, their pride and admiration showing even if the tenor of their words seems harsh to the casual observer. Sweat pouring off both of them, Nunes and Barzini leave the octagon once the simulation is finished. Nunes is all smiles, feeling good about her performance. Barzini exhales and collapses on the floor. "She hits so hard," he says. "If I was lighter, I'd be knocked out." "She turns into something completely different when she fights," Krahl says. "She has that switch that goes on and she becomes vicious." Regardless of her level of confidence, she will need that tenacity when she steps into the octagon on Friday. The opportunity is seismic, both for gain and in loss. Nunes has waited for this chance to prove herself and hopes that, with a win, she'll inspire belief in her as a champion and a fighter -- that she didn't get lucky. She has earned this. No one knows for sure exactly which version of Rousey will show up, but Nunes has no illusions about who she is facing. "I wait for the best Ronda Rousey."